For starters, let me say thanks to the Columbia Center for Oral History (CCOH) for their help with this episode. This is the second of three podcast episodes of stories from Eddie Dowling, a theater giant who produced, directed, and starred in the original 1945 Broadway production of Tennessee Williams' play "The Glass Menagerie." These stories come from a set of oral history interviews with Dowling conducted in 1963. The original interview tapes no longer exist, just the transcript, so you'll be hearing me, Paul VanDeCarr, reading from the transcripts with whatever meager thespian talents I've gained from watching theater and film over the years! You can listen to this episode on the player above, or subscribe to the podcast for free in iTunes. In the first episode, Eddie Dowling talked about meeting Tennessee Williams, falling hard for "The Glass Menagerie," and assembling a cast. In this second episode, Dowling tells the story of theater critic George Nathan's role in shaping the play, or at least sending Tennessee Williams into despair, and of the Chicago run and the nerve-wracking Broadway premiere. 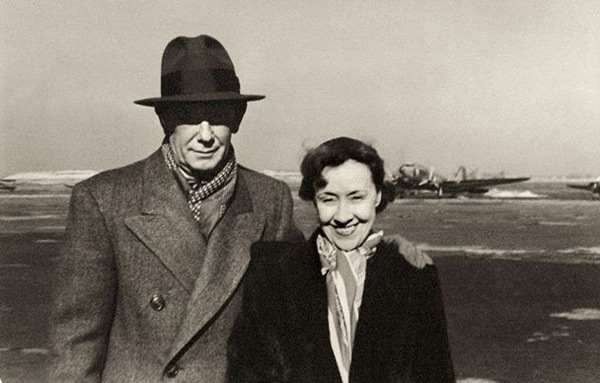 Eddie Dowling and wife Ray Dooley, from this Camden history website. In the third and final episode of this mini-series, which I'll release next week, you'll hear about the acclaimed but rocky 18-month run of the show, and the fate of leading lady Laurette Taylor. Big thanks to the Columbia Center for Oral History (CCOH) for permission to use these stories in the podcast. You're welcome to share this podcast, but if you want to cite or use this interview in a project of your own or in some other context, you'll have to ask CCOH for permission. The contents of the Eddie Dowling interview are protected by copyright, and may not be cited, reproduced, or otherwise used without express written permission from the Columbia Center for Oral History, at Columbia University in the City of New York.